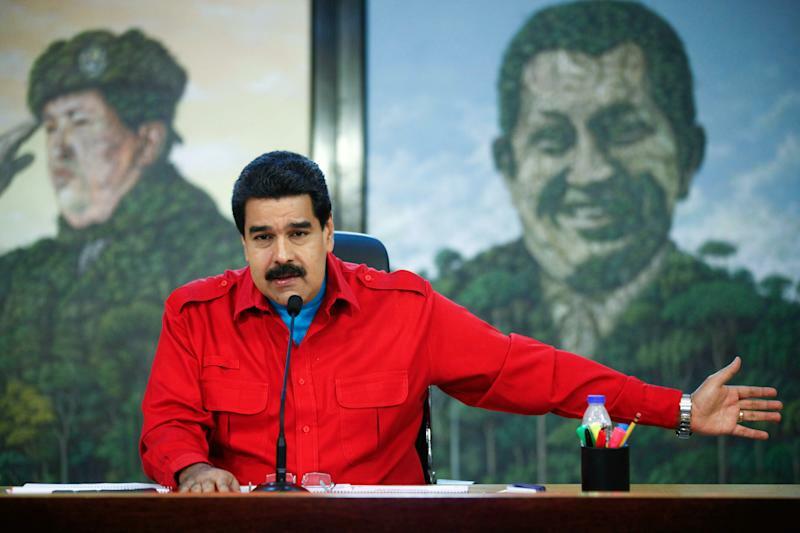 Caracas (AFP) - President Nicolas Maduro charged Saturday that tighter, "stupid" new US sanctions are just further straining to undermine military staff loyalty after Venezuela derailed a bid to oust him. "These sanctions are a threat -- to see if they can break the morale of leaders of our armed forces ... in March, I announced that we put down an attempted coup d'etat, thanks to our brass' loyalty," Maduro said at a speech in Caracas. The tighter US sanctions freeze assets and deny visas to Venezuelan authorities responsible for violence and political detentions triggered by the protests. "Have you ever heard of such arrogance?" leftist firebrand Maduro asked angrily. "As if we cared about visas to get in the United States. ... Idiots!" he roared. On Saturday, Maduro -- the general elected to succeed late longtime President Hugo Chavez -- also suggested involvement by the US embassy in the June plot to topple him, which he said aimed to use a Venezuelan military aircraft to bomb Caracas targets. "The coup plotters were trying to get a plane here or bring it in, with Venezuelan tags," Maduro said. "The number-one bombing target was (state and regional news channel) Telesur ... then the defense ministry and then the presidential palace." "I can tell you, US embassy officials: one by one: I know who is plotting. And I can tell you this: if your stupid sanctions law serves any purpose, it will be to strengthen our fighters' resistence." On Wednesday, the US Congress gave its final approval Wednesday to new sanctions against Venezuelan officials accused of violating the human rights of anti-government protestors this year. Thousands of activists were arrested and more than 43 people were killed during mass demonstrations against Maduro's government, which raged from February to May. The US hit Venezuela government officials with travel bans in July, but lawmakers said they did not receive White House support for a sanctions bill against Caracas. But failed efforts from Latin American allies to reform the government in Venezuela led US President Barack Obama to switch his stance on increased sanctions, the White House said in November. Maduro, whose popularity has sunk to record lows amid economic woes and rampant violent crime, has called a rally for Monday against the US sanctions.